UK emergency services are currently going through unprecedented levels of change, driven on the one hand by massive cuts to their funding and on the other by the rapid pace of technological advances. Focusing on the latter in particular, this has impacted life on the front line and in the control room in two ways. First, the development of increasingly sophisticated digital communications has improved things considerably from an operational point of view. Arguably the best example of this is the now almost ubiquitous use of body-worn video by police forces for the collection of evidence on-scene. At the same time, technology has also enabled organisations to achieve efficiencies as they continue to operate in the shadow of the aforementioned cuts. Solutions falling into this category include Airwave’s digital admin app Pronto, which allows officers to stay out of the station for longer, while at the same time saving on paper. Nowhere is the intersection of these two benefits better demonstrated than in Northamptonshire, where the FRS and police’s new multi-agency mobile incident unit is providing commanders with connectivity-enabled mission-critical information while situated right at the heart of the action. Rolled out for the first time in late 2016, the story of Northamptonshire FRS’s new incident command vehicle began late the previous year with the acquisition of money from a government-run initiative known as the Fire Transformation Fund. It has since been deployed to a variety of high-profile situations including last year’s British Grand Prix at Silverstone, as well as a major incident in Northampton. “Our previous command unit was coming to the end of its life, which provided us with the opportunity to do something different. Before work began on the vehicle itself, however, a huge amount of discussion was carried out to ascertain the requirements of the respective emergency services involved with the project. Indeed, according to Northamptonshire chief fire officer Darren Dovey, the involvement of other public safety agencies in the county was integral to the project getting the go-ahead in the first place. He continues: “As a result of close working with the police, which already existed as part of a programme of collaboration within the county, a lot of the potential cultural barriers between the two services had been broken down. “Of particular importance in this regard was our police/fire joint operations team which produces joint operational policy and event plans. There were also two further contributing factors involved in laying the cultural groundwork for the new command vehicle. The first of these were the instincts of the county’s first police and crime commissioner Adam Simmons, who had already commissioned an interoperability scoping exercise as far back as 2013. The other was the ongoing development of the core JESIP principles, as formalised in its interoperability framework doctrine. These include: co-locate, communicate, co-ordinate, jointly understand risk and share situational awareness. As mentioned, Northamptonshire Fire and Rescue Service was awarded the funding for its new mobile command unit in 2015. This was achieved in large part because of the understanding that the emergency services within the county had already developed between each other. There were still other, operational gaps to negotiate, however, not least around the use of the vehicle itself, with the police and the FRS historically adopting two completely different strategies when it came to their respective tactical command points. Discussing this, Pells says: “Traditionally the police’s doctrine was that tactical command was run remotely from a ‘Silver’ command room. The next stage in the mobile unit’s development lay in clarifying what each agency needed from an operational point of view, and in particular how those needs crossed over. An extensive research effort looked in particular at other FRS mobile units as well as examining specific police operational requirements including various police specialisms. CFO Dovey continues: “To ensure the vehicle met operational and tactical command requirements, the project was led by both group commander Pells and superintendent Hillery from Northants Police. They are both experienced commanders, who provided assurance of the capabilities which were required and ultimately delivered. Once the initial discussions were carried out, the serious work of building the vehicle began, with the first priority being ease of use for the command support teams tasked with operating within it, alongside future-proofing with one eye on the forthcoming Emergency Services Network. Information streams available to those on board derive from a variety of sources, including the unit’s own deployable static camera, body-worn video, as well as a drone. Rather than 4G, these work using a system called COFDM (coded orthogonal frequency division multiplexing) which, while expensive, is also absolutely reliable when it comes to both coverage and latency. All video feeds can be live-streamed to FRS and police control rooms, and indeed anywhere with authorised access to the footage. 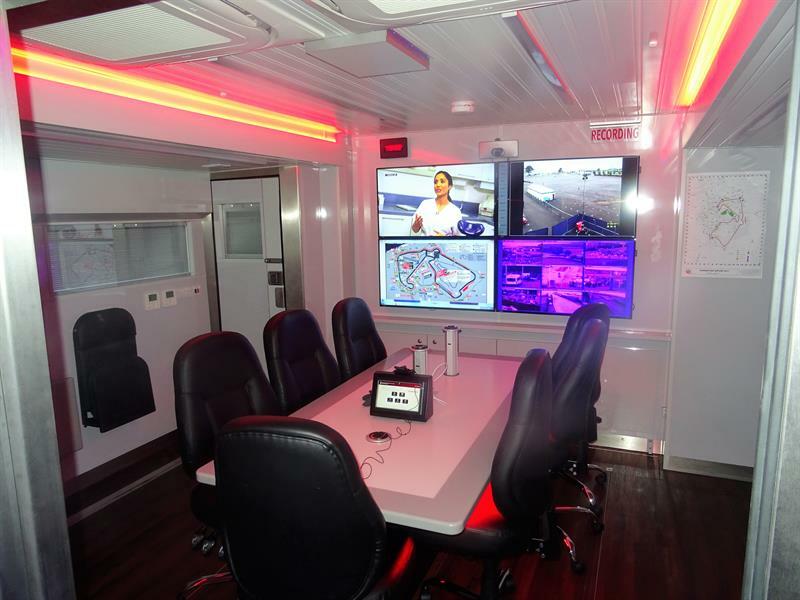 The vehicle contains multiple screens, the largest of which is situated as part of a bank of devices on the wall of the main command room. According to Pells, the idea is simply to give everyone the same level of situational awareness, leading to more effective decision-making, particularly during major incidents such as flooding. The broadband for the vehicle is provided by two 4G cards, linked to a roof-mounted antenna rack. This same antenna rack is also where Wi-Fi is sent from to provide the ‘bubble’ around the vehicle. The Wi-Fi unit is a Pepwave system, located in the server room, tucked away towards the back of the unit. Alongside the digital comms element, a huge amount of planning also went into the ‘user’ aspects of the vehicle. In particular, these include heating and air conditioning, as well as ergonomic details such as comfortable seating, and a compartmentalised interior, different areas of which can be closed off to accommodate any meetings that are taking place. Other less obvious features include the walls, which double as whiteboards, and the ability – with the knowledge of those on board – to record all conversations during incidents. Looking beyond the thorny issue of funding, it is a truly exciting time for the UK emergency services, whose horizons are on the verge of being massively expanded by the arrival of the Emergency Services Network. (How imminent that arrival might be is, of course, a different conversation – see page 10 of this issue of Land Mobile for more details on the project’s status). Northamptonshire FRS and the Police’s new mobile command vehicle symbolises the increasing opportunities presented by digital communications, both for closer and more efficient working, as well as improved situational awareness. Excelerate, which kitted out Northamptonshire FRS’s new joint command vehicle, describes the COFDM video technology in this way: “It transmits thousands of data packets that aggressively rebound in multiple directions en route to the receiver. The company’s COFDM solution is called RapidNet, which it claims can operate without being line-of-sight with the transmitter, even with mountains or buildings in the way. As in the case of the mobile command vehicle, the solution can integrate with body-worn and rapid-deploy cameras, as well as Excelerate’s automatic pole-climbing camera, Sherpa.